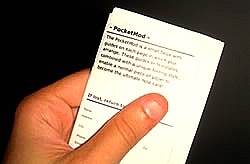 I know I may be late to the party on this, but have you used PocketMod? It's a free customizable pocket organizer. You create the type of lists (games, calendars....etc) that you need on a daily basis, print and cut. I love free and simple solutions, don't you?